Just like Cody of AlternateHistoryHub, I was blown away by Sean McNight‘s map of the “Seas of the Sahara.” Sean’s map is about a future geoengineering project, and Cody’s scenario begins 7,000 years ago, but mine goes back further. 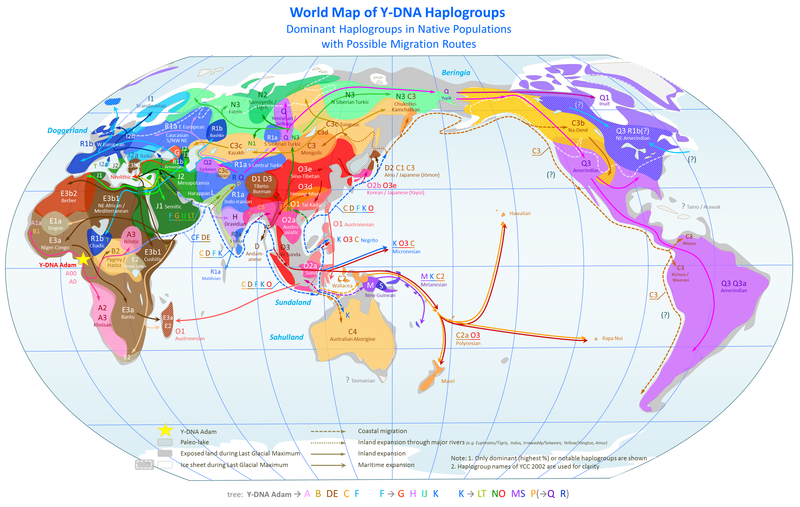 Two of Adam’s descendants went east and south to produce the Nilotic (A3) and Khoisan (A2, A3) haplogroups respectively, but a third went north to produce A1a. 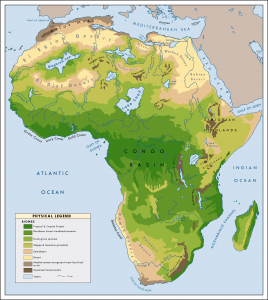 Had the Sahara been greener, this population might have grown. In Our Timeline, a mutation occured either in central or west Africa, producing the Pygmy/Hadza people (B2). 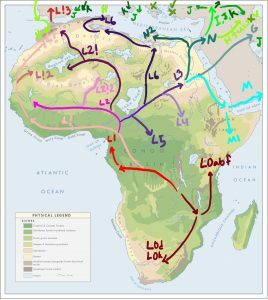 Similar Y-chromosomes show up in the southwestern Sahara as B1. So there’s our next population. Mutations C, D, and E occurred on the way to the Horn of Africa. 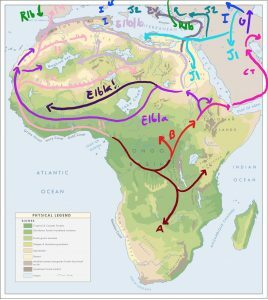 C and D went on to colonize the rest of the world, but carriers of E hapolgroup went north up the Nile Valley (producing the E3b1 NE African/Mediterranean and Cushitic people) and west across the north coast of Africa and the E3b2 Berbers), west to begin the Dogon (E1a) and Niger-Congo (E3a) people, and south in the more recent Bantu migration (E3a). And don’t forget the mutation in Anatolia that produced the Semitic (J1) population, which colonized Arabia, Egypt, and parts of Northern Africa. Nor the R1b mutation in the Caucasus present in Western European and Chadic people. In This Timeline, they’re even hungrier for a piece of Africa, as are the southern Italians (J2), the I2a people now found in the Balkans and Sardinia, and even haplogroup G, once common in southern Europe but now found mostly in the Caucuses. The result is an Africa (even) more diverse than the one in Out Timeline. The El Eglab Desert in northwestern Africa is still inhabited by people something like Berbers (they speak an Afro-Asiatic language, but with an unexpected number of click phonemes). The desert people have have settled cousins living as merchant-princes around the Maghreb Sea, however, and they’re all in fear of subjugation by the only vaguely Berber Tamarasett Empire on the west coast. The Choti Sea is especially diverse: a mix of Berbers, Semites, and a bunch of tall, grumpy Cyclopeans (they have two eyes, but they like building big stone temples). The area around Lake Fezzan has its own merchant-princes (rather more prosperous than the ones around the Maghreb Sea), with ties to great civilizations of Italy, Greece, the Levant, (an oddly Indo-European) Egypt, and Chad. This has unfortunately meant a lot of slaving, with the diminutive hunter-gatherers of the deep savanna most often taken. The slave takers (mostly drawn from the people living around the the Sahabi and Rabiana rivers) speak an ergo-absolutive language and are pretty odd ducks, themselves. Things get sketchy further south. Horses die in the Congo Basin, and while Chadian ships have passed through the Cape of Good Hope, they didn’t find much worth pillaging. Every now and then, when the state of the Horn of Africa are particularly troublesome, the Chadians (or even more rarely, one of those upstart Tamanrasettians) will find it profitable to hack some trading posts out of the jungle and sail “the Southern Route.” Generally, though, the Ethiopians are happy enough to mediate trade between Chad, the Swahili Coast, and distant India and China. This entry was posted in Wonderful, Awful Ideas and tagged Alternate History, Language, Saharan Seas. Bookmark the permalink.